"Han lägger osthyveln på osten." Translation:He puts the cheese slicer on the cheese. To be clear, this is not actively using the tool, but physically situating it atop the food? Han lägger osthyveln på osten och skär av en skiva. I grew up always using a cheese slicer, but it's more like a wire on a handle.
. . . and a cheese-slicer statue! I was always told that osthyvel meant cheese shovel. I entered that name and was surprised to get it wrong. I've never heard of a cheese slicer. Don't you just use a knife? But this is what a cheese slicer looks like. Every Swedish household has one. I'm brazilian and I use a cheese slicer. Before this comment I tought cheese slicers were very common in the world. Looks like it is not, huh? How can they not use a cheese slicer?! I agree with Zmrzlina. This definitely raises Brazil a notch in my opinion. Have some lingots. Can you buy them in Brazil? I know Swedish immigrants who always bring cheese slicers when they visit friends in their home countries, so I just thought that maybe your slicer is a gift from a Swede :)? I don't know whether the Dutch course covers this word, but in Dutch it's called a kaasschaaf. It standard equipment in every Dutch household too! It looks so funny. I have never seen one before. It's God's gift to mankind. My parents (in London, UK) have always had one of those, a nice one with a wooden handle. It is indeed very civilised. Theirs could have been a gift from Finno-Swedish friends, but my partner (also British) says his family had one too and "they're everywhere". The cheese slicer makes perfect slices only on the kind of cheese you eat. It is for istance impossible to use on parmesan cheese for which you use a normal knife or much better special dedicated ones (https://www.parmigianoreggiano.com/taste/store/default.aspx). And there are other cheese which are very very soft (for istance stracchino, squaccherone, ...) and even in this case you cannot use your slicer, use a spoon instead. 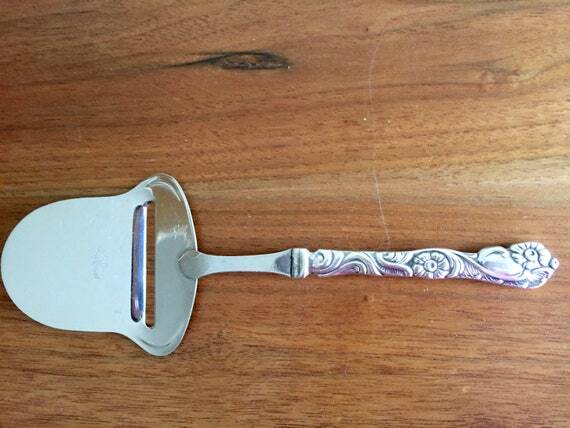 Btw, i have a cheese slicer which i bougth in Norway many years ago but until now i haven't ever used. I said cheese grater and it was wrong, so...no idea. Ha! I like the third one down, one over. It looks like a slice of swiss cheese. I've always just used knives to slice cheese. Ok, that makes much more sense! Thanks! How would you say he "sets" the cheese slicer on the cheese? Wouldn't that be the same thing? "Sets" being the same as the given translation "puts" ? ställer is setting something in an upright position (standing it). lägger is setting something down flat (laying it). Those are the two versions of "put" I've seen within this course, but two other versions sätta and placerar also appear to exist for set and place. I would have thought they were the same too. I said "He sets the cheese slicer on the cheese" and it marked it wrong. Personally, I try to use the closest matches, so stands ands lays, rather than puts and sets, since Swedish likes to convey that extra meaning. Cheese says: "aaaaaaaarggghhh noooooo oh lord noooooo argohhgfhh please have mercy noooooo" while struggling to escape. Cheese grater is wrong, suggested a cheese parer...WTF is a cheese parer? Is this a UK thing? It's a cheese slicer. Except paring is more like peeling, so it's the kind of slicer you drag across the top of the cheese block to peel some off. Not knowing that is kind of like not knowing which side of the plate to set the fork. Not a UK thing. Just a culinary or formal thing. Grating is more like shredding, so cheese grater is wrong. Cheese slicer is the default translation, so you need not worry about the word parer. We always had a cheese slicer (second row, second from left) at home growing up (UK). When I went to uni it was a big shock that no-one else had them, mine was a great curiosity item. But only realised it was a Swedish thing much later (my mum's family are Swedish).